Here at MarginRich.com, I mention Jeremy Grantham and his firm GMO quite a bit. That is for two very big reasons. Number 1, he and his firm manage in excess of $100 billion for the biggest institutional investors across the land. And number 2, he’s publicly nailed multiple bubble calls. Does he nail them to the day? Well no, but he’s been close enough and has effectively ensured his clients were positioned accordingly to mitigate the damage of the last two major stock market bubbles. Why do you think this forecast is so negative? It may be valuations, but I think it’s because they see a major dislocation occurring within the next 7 years. This dislocation will cause most sectors to lose money over the specified time period. And of course depending how one is positioned, losses can and will be a lot worse than what is depicted in the chart. GMO will never reveal the secret sauce, so to speak, behind their methodology in determining their 7-year forecast. It’s probably safe to assume they use an amalgamation of various data inputs involving valuation, macroeconomic outlooks, interest rates, monetary trends, geopolitical trends, and so forth. You don’t need to be able to reproduce the forecast in order to trust it. 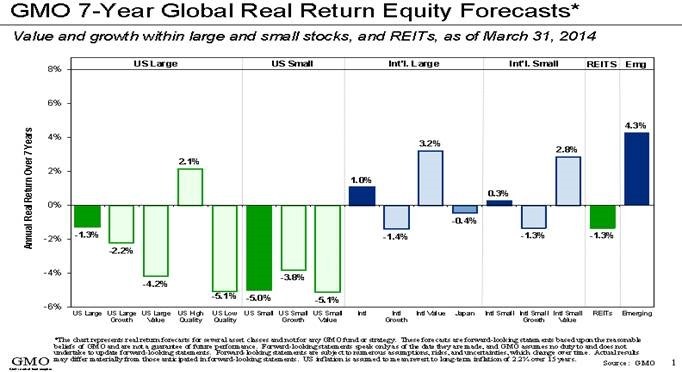 Knowing that this is how GMO perceives equity market returns going forward, one really needs to be conscious with their long-money portfolios. This is a message I have been consistently sharing over the past few articles, so let’s visit a few severe distortions that may have a major effect on equity markets within the next 7 years. The first distortion is excess reserves maintained at the Federal Reserve. This first chart is to show how ridiculously large this number has grown to, which is now in excess of $2.4 trillion. That’s the cumulative and collected excess reserves of the banks who collude conduct business with the Federal Reserve. Notice how before 2007, the amount was virtually zero. 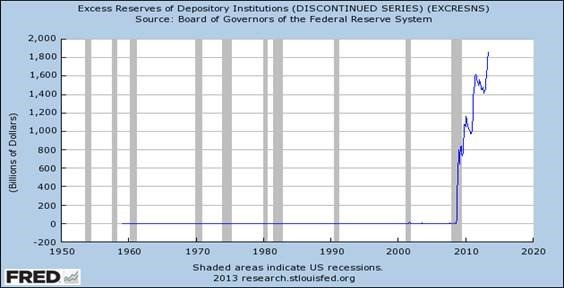 I realize this chart only goes back to the early 1980’s, so here’s a “Discontinued Series” chart that the Fed previously utilized to report the excess reserves. It goes back to the 1950’s and shows the same virtual zero in excess reserves as the normal course of business. That’s right, up until the Great Recession the amount of excess reserves held at the Fed was in the single digit billions. That’s basically zero. Since 2007, it has been a different story entirely. For the uninitiated regarding excess reserves, I want to provide a relatively brief explanation. For the reader with an already good grasp, I apologize for any redundancy. 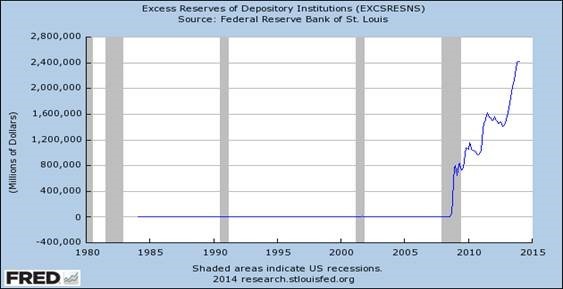 The excess reserves were at virtually zero for all those decades because the Fed never paid any interest on them. Then in response to the entire financial world sitting on the precipice of obliteration, a multi-part plan was instituted in order to maintain the status quo and keep the entire system intact. The federal funds rate was dropped to zero where it has stayed, interest began to be paid by the Fed on excess reserves, and the process of quantitative easing(“QE”) was illustriously birthed. The federal funds rate was dropped to zero so as to stimulate the economy in the face of certain deflationary doom. The book is still out on whether the US has seen true economic improvement due to ZIRP. What we do know is that savers are being heavily penalized by this policy and investors of all ilk are being forced up the risk ladder in increasingly desperate attempts for yield. The paying of interest by the Fed for excess reserves is one of the Fed’s tools for maintaining interest rates where they want them. It also just so happens to be able to provide a colossal liquidity buffer for the so called balance sheets of the participating banks i.e. Wall St. Between the erroneously valued derivative books across the entire industry and jumbled collateral chains, the participating banks and the Fed think they’ve built an adequate buffer to potentially withstand additional impairment to balance sheets. And why shouldn’t they? They’ve got everything under control because now they can taper QE. Quantitative Easing was established to fight both fronts of the policy as a tool to reduce long-term interest rates while also stimulating the economy. Do you feel like the economy is stimulated? I know one thing for sure that has been stimulated and that’s asset prices. Take a moment to yourself and remember how this story has played out for the Weimar republic of Germany, recently in Zimbabwe, and even more recently in Venezuela. Wondering why it matters so much that the banks keep their excess reserves at the Fed instead of productively using them within the economy? It’s because the money is essentially free. When the Fed monetizes its debt and buys assets such as MBS, it creates an asset on its own balance sheet and a corresponding liability. That liability is the excess reserves that belong to the TBTF banks who are the Fed’s main partners in facilitating QE. The banks keep those excess reserves with the Fed because why would you give away your gravy train and expose it to more unnecessary risk? The Fed pays 0.25% on excess reserves. May not seem like much, but 0.25% on $2.4 trillion equals $6 billion for the biggest banks to collect risk free in interest income. If you were a bank CEO and knew you had derivative exposure that could single-handedly dismantle the system, would you kill the golden goose provided by the Fed? The proof is already in the pudding as the velocity of money is cratering but has had no material effect on our economy thus far. There’s no velocity of the money supply because banks aren’t lending out to businesses and households. Sure large corporations have been able to finance buy-backs and special dividends but capital expenditures have yet to reach a point of acceleration where we know some good economic tidings are bound to follow. 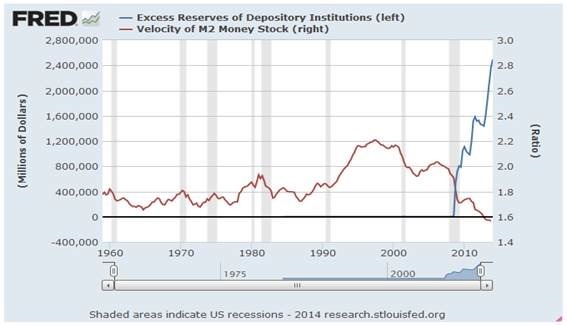 In the chart below, I’ve overlaid the rise of the excess reserves vs. the velocity of the M2 money supply. If that’s not a chart yelling out for some mean-reversion, then I don’t know what is. So what are some triggers to increase velocity and why does it matter? An increase in velocity matters because that price inflation that everyone was so scared of during the beginning phases of TARP and QE, could finally begin to materialize. And this could hamstring any efforts to get the economy breathing on its own without the use of a respirator. As far as a trigger to generate velocity, it would take the Fed no longer paying interest(like they’ve almost always done) or even charging to hold excess reserves. The participating banks would immediately withdraw that $2.4 trillion in cash and put it to work. Where? Businesses and households. If those dollars hit the economy in a flood over the course of a year or two, we could see some scary jumps in asset prices that matter and not just fine art and collectible cars. Not to mention, there’s still all that cash that the mega-corporations keep parked internationally. If the US were to shift tax policy for this money and it were to be repatriated and spread around the economy, we could be talking about a doubly increase in money velocity. The Fed knows this and you would think they wouldn’t be dumb enough to cut off their nose to spite their face but the Fed is backed into a corner. Additionally, the Fed has to answer to its political masters all while managing the world’s perception of America’s currency and economy. This is a dangerous game being played right now, as after 2008, Fed policy entered the realm of pure experimentation. Would the Fed have maintained these policies this long, which are causing massive economic distortions, if the economy had really reached escape velocity or at least was well on its way? Let’s revisit interest rates, the second massive distortion. Gary Tanashian, with his Notes From the Rabbit Hole newsletter, provided an elegantly simple chart putting on full display the lack of efficacy of the Fed’s ZIRP policy to have any material effect on the economy. Below you’ll see the 3-month T-bill yield($IRX) overlaid against the S&P 500 index($SPX). You can see in the past 20 years that as the economy and markets picked up, the Fed would subsequently raise interest rates. That is completely normal policy and has been consistently used for decades. But as you can see in the chart, where’s the rise in rates? The correlation of the two are generally fairly strong. Oh, so our economy is not genuinely approaching a growth level that warrants a raise in interest rates? These are the results of the great financial experiment, of which we are all a part of the double-blinded no placebo study that’s about to have a phase 3 letdown in the next year or two. The Fed has been able to subvert a normal business cycle by reflating on demand through interest rate policy and monetary policy. That last doozie back in 2008 should have seen the destruction of several industry giants and the Fed wasn’t ready to allow that to happen in America. I get it. The pain and suffering would probably have been unspeakable and potentially worse than the Great Depression. When you combine the fact that the developed countries are so interconnected, the US didn’t want to single-handedly bring down the entire world’s economies. All that being said, the tricks to perpetrate the subversion of normal business cycle forces have been used up. You can’t drive interest rates any lower. You can’t print even more dollars and expect sufficient potency. Hence, the notion that the Fed is backed into a corner. These distortions are what the doomsday types, Austrian economics practitioners, goldbugs, and similar minded types have been seeing and simply can’t seem to shake off. The team at GMO has never been labeled as any of those types; only true professionals’ professionals in the game of capital allocation. 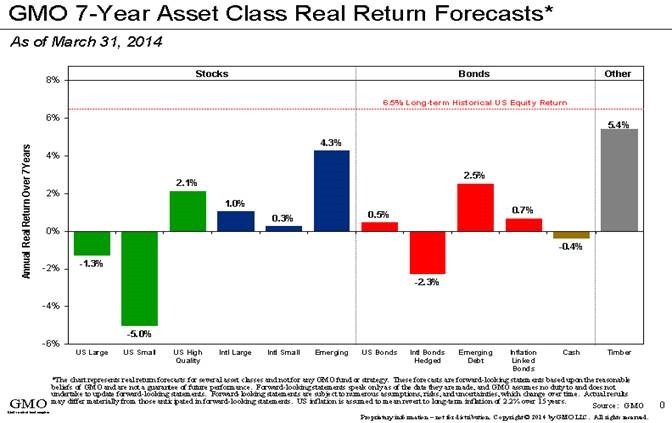 Below is the other chart in their 7-year forecast and it covers multiple asset classes as opposed to just equities. The granddaddy winner for the next 7 years is timber, according to them. So forget about investing. Go cut some trees down. Chop’em up and store them in your house. Over the next 7 years that wood will have outperformed your 401k. Lame jokes aside, there are a few ways to easily make a play on timber. There are of course the biggest North American players such as Plum Creek (PCL), Weyerhaeuser (WY), Rayonier (RYN), and Potlatch (PCH). If you prefer ETF’s, there is iShares Global Timber & Forestry (WOOD) which focuses on North America and thus has significant positions in the largest players here. For more of an international flare to your timber exposure, Guggenheim offers its own Timber ETF (CUT). A cursory glance of CUT’s holdings will show that it focuses its holdings around the planet as opposed to N. America. Since the average joe can’t simply invest in huge plots of timber like a hedge fund, endowment, or pension fund, then these are decent options to play the sector. PCL is the biggest of the N. American group and thus has a well established reputation on the street. However, friends and old colleagues will already be familiar with what is probably my favorite way to garner some timber exposure, and that is through Brookfield Asset Management. BAM! Remember though, at the end of the day these are still equities and have the potential to be pulled down with every other sector in the event of a sell-off or major dislocation. Comparing Plum Creek to Brookfield Asset Management is not exactly an apples to apples comparison, as Brookfield is a massive asset manager focusing on real or hard assets with a portfolio approaching $200 billion. Plum Creek possesses the largest portfolio of timber acreage in N. America, so their market capitalization is justified. PCL carries a timber portfolio worth approximately $5 billion. Brookfield’s portfolio of timber acreage is significant in real terms but small compared to their entire portfolio. BAM carries approximately $4 billion worth of timber assets, and that is after selling approximately $2.5 billion worth of timber assets last year to Weyerhaeuser. BAM will monetize assets when appropriate. They don’t hold just to hold, however they’re considered some of the finest value investors in the world when it comes to real assets. Let’s take a side by side look at long-term performance of each company since 1990. We’re using 1990 as PCL was founded in 1989, so I wanted to give it a year of operations under its belt for comparison purposes. The following chart compares the split adjusted values of each stock starting with an initial $5,000 and includes dividends but excludes the two spin-offs(BIP & BPY) from BAM. You can see that BAM’s long-term performance speaks for itself. If you account for BIP & BPY, then to me it appears to be a no-brainer between the two for long-term exposure to timber. PCL’s dividend is vastly bigger, so if an investor needed that higher yield for whatever reason then it would make the decision of choosing between the two a little tougher. Overall though, if you want some timber exposure in combination with other world-class real assets then BAM is a heckuva way to play it. Valuations matter. Momentum can be ridden, but in the end a stock’s price will revert to an appropriate valuation after momentum has made investors lose their collective minds. GMO’s forecast is not to be taken lightly. It’s just another recent indicator that should really make investors pause and think before allocating capital. I tend to concur with old Uncle Warren in that it’s not usually a safe bet to bet against America, so I promise that I’m not a total gloom & doomer here at MarginRich.com. These economic distortions, just a few of so many, are communicating a signal that America and really the world’s developed markets could find themselves in some pretty rough seas in the not too distant future. Invest accordingly.